...that Déjà was a dumb AI attached to the SPARTAN-II program as a teacher and assistant? ...that Earth was known as Erde-Tyrene in the distant past? ...that a Covenant CPV-class heavy destroyer is 1500 meters long? ...that Spartan-III players have a death animation in Halo: Reach that depicts them aiming their weapons at the enemy in front of them while crawling on the floor? A battle during the Second Ark Conflict. 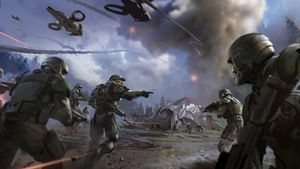 The year 2559 was a time period filled with many large battles: the ongoing violent Sangheili-Jiralhanae war, an isolated skirmish on Installation 00 between the UNSC Spirit of Fire and the Banished, and the overarching Created conflict. January 16: The survivors that fled the Henry Lamb Research Center on Installation 00 stumble upon a transport route set up by the Banished to move mined resources. The group rests and argues for a while concerning which direction they should head in next. January 17: Nathaniel Palmer records that including himself, only eight survivors in their group remain. January 23: Aboard the UNSC Infinity, Spartan 92738-61842-LC of Fireteam Apollo interviews Spartan Commander Sarah Palmer as part of their investigation concerning the root cause of the recent decisions made by the artificial intelligence Cortana. January 24: Spartan 92738-61842-LC continues their investigation regarding Cortana with an interview of Doctor Catherine Halsey, her creator. March 4: Orda Val 'Saham records his thoughts on one of the Ark's Cartographers and its link to the Covenant faith. March 28: After 28 years of drifting in space the UNSC Spirit of Fire finds its way to the orbit of the Forerunner Installation 00, known as the Ark. Awakened from cryo-sleep, the crew eventually travels down to the Ark to find out how to establish contact with the galaxy. However, on the surface of the Ark they encounter a hostile, violent mercenary faction known as The Banished, led by the cunning Jiralhanae warlord Atriox. March 29: Seth, an A.I. aboard the Spirit of Fire, cross-analyses transcripts, incident report data, and a past surveillance report provided by the Logistics Smart A.I. Isabel in order to compile a research report on Atriox for Captain James Cutter. Ellen Anders learns more about the Forerunners thanks to Isabel, and wonders about the Librarian's plan for humanity, but she focuses her attention on helping the crew against the Banished. March 30: Two Unggoy attempt to desert the Banished, but they are executed by Balkarus. Decimus is killed by UNSC forces. Immediately after his death, the Spirit of Fire is attacked by the Enduring Conviction. April 1: The Enduring Conviction is destroyed by Jerome-092 and Isabel when they forced the Ark's Aggressor Sentinels into attacking the ship. A Halo ring is discovered on the Ark's Foundry. April 2: Ellen Anders and Installation 09 leave Installation 00 in hopes of getting to the Soell system, but are intercepted by a Guardian before they arrive. May 1: Squad Sunray 1-1 manage to halt the Banished's plan of using a Forerunner Despair-class fighter to destroy the Spirit of Fire. June 1: Comms officer G. Peterson records what he observes of the area surrounding the wreckage of High Charity on Installation 00. June 4: Lieutenant Voridus of the Banished inadvertently releases the Flood from within the containment shield around High Charity. A Sangheili shipmaster returns to the glassed human colony of Kholo. The species wide war between the Sangheili and the Jiralhanae is still ongoing. Yapyap rebels against the Banished. ↑ Halo Wars 2: Awakening the Nightmare, What Could Go Wrong? ↑ Halo: Evolutions - Essential Tales of the Halo Universe "The Return" - "It was a terrible war. The Prophets provided the Brutes with powerful new weapons, hoping that they would in turn defend their Prophets against our wrath. But when the Prophets went into hiding, the lack of leadership allowed the Brutes to return to their savage nature and they soon began to fight against each other. This lack of solidarity made them much easier prey. Some of my fellow commanders continue that fight even now"